We know that there are quite a few homesellers in rather distant locations like the Americas, Australia and New Zealand who have property to sell which is located in Europe. 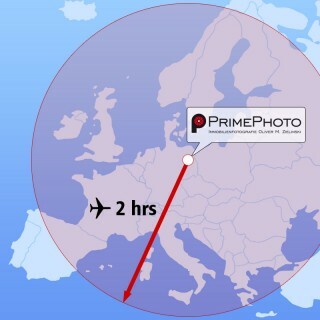 PrimePhoto is the right partner for assignments like this. We are located in the heart of Europe. Most destinations are accessible within two hours flight (and some land travel). Which is ideal in terms of cost effectiveness. We operate with professional equipment at travel size. Which is still fully functional. This way we can guarantee the best image quality paired with low transportation cost. Thus communication with international clients will be a no-brainer. And of course we also serve any other location around – in Germany anyway, but also in Poland, Czech, Austria, Belgium.